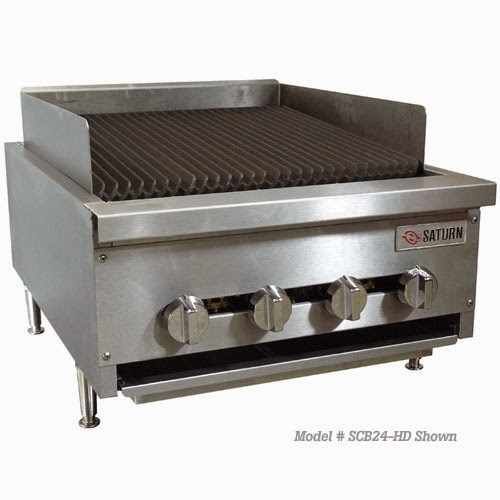 Saturn gas charbroilers are essential if your restaurant or commercial kitchen serves burgers, steaks, chops, fish, or chicken – any meat, seafood or poultry – quickly and effectively. And MPM has two of the most-requested, brand-new Saturn units on sale now, so you can equip your kitchen with a reliable and popular unit in the most price-effective way possible. The Saturn SCB24-HD and the larger Saturn SCB36-HD charbroilers are available, in stock and ready to be shipped today. MPM Food Equipment Group has these units in the warehouse. We are offering each of these units at over 60% off the list price. The SCB24 is on sale for $1,203.00. The list price of that unit is $3,344.00. That's a savings of $2,141.00. The SBC36 is going for 1,572.00. That is down from a list of $4,367.00 - a savings of $2,795.00. You are not going to find a commercial-grade charbroiler on the market at a price comparable to this deal. Made from stainless steel, the charbroilers in the Saturn SBC series are built to stand up to whatever punishment your staff can mete out, lasting you for years. The four-burner 24-inch model produces 80,000 BTU of cooking power, while the six-burner36-inch model can produce 120,000 BTU. This grilling power will help your staff cook chops and meats quickly and easily, which is especially important when the rush is on. The even heat ensures uniform cooking times. And each of the burners is able to be controlled independently, so that you have the needed flexibility and control. It's been said that a good charbroiler can be the heart and soul of a commercial kitchen. If you want to serve burgers, steaks, chops, fish, and chicken quickly and effectively, you need a model that will accommodate your menu and the volume of the restaurant. The Saturn SBC series heavy duty gas charbroilers feature high performance and quality construction and are designed to handle a high volume. Consistency is critical, especially when food production volume is high. These are durable pieces of equipment that can withstand years of heavy use. Each of these Saturn charbroilers will represent a vital piece of equipment for you, because these units are responsible for preparing the priciest menu items. Beef, chicken, pork, lamb and other proteins are the most common items prepared with these units, as well as solid fish varieties including salmon and swordfish. You will also use these units to grill vegetables that hold up well under high heat, including Portobello mushrooms, asparagus and eggplant. These Saturn charbroilers allow you to have the grilled taste of an outdoor grill, but with the convenience of cooking indoors. Primarily used for cooking meat – such as hamburger, steak, fish, and chicken – these units also help to finish off dishes and reheat entrees, because they are capable of cooking anything you would cook on a conventional outdoor barbecue. Since each unit produces high heat, you are able to seal in the flavor for quick-grill items such as steaks. This high heat enables you to cook your meat quickly and properly, and to develop the necessary char on the outside of the steak. For burgers, you are able to achieve a notably smoky and broiled taste that burger fans love. Are you ready to put one of these Saturn Heavy Duty Gas Charbroilers in your restaurant at an unbelievable price? Call MPM today at 1-800-976-6762, or email us, and remember to turn to MPM Food Equipment Group for all of your commercial kitchen equipment needs. We sell the highest quality restaurant equipment and follow up with the best service in the industry.